I assembled a group of 14 members of the church, most of them new-ish to the church, and tasked them with the job of looking at the vision and mission of the church, and evaluating our strengths and weaknesses with an eye toward pushing us forward. They have met six times since last December, and have given me lots of food for thought. They took seriously the church’s own mission statement, and decided to make it shorter, snappier, and action-able. The group determined that there are four markers of a disciple at KPUMC. First, one is welcomed unconditionally into the community, and extends unconditional welcome to others. This is a hallmark of the KPUMC ethos; our decision to be a Reconciling Congregation affirmed this desire. Second, a disciple is connected to others, not simply through attendance at Sunday worship, but through small groups, Sunday School classes, and other opportunities for fellowship. Nobody can be a Lone Ranger disciple; the walk of faith demands fellow travelers. Third, a disciple is always growing closer to God. This is done intentionally through participation in worship, Bible study, and spiritual practices, such as prayer, labyrinth-walking, fasting, and meditation. And fourth, a disciple is ready to help others, by getting her hands dirty in the mess of ordinary life. This can happen through formal and informal missions, as well as advocacy work for social justice. That’s how these four words — Welcome, Connect, Grow, and Help — became the heart of the proposed mission statement. They are a very simple and concise summary of the Christian life. It’s so simple, and yet so full of rich potential and hope! The Vision Task Force would love to hear your comments, opinions, and suggestions about their work. Please look at the presentation here, and then forward your thoughts and questions to ashbryan09@gmail.com. 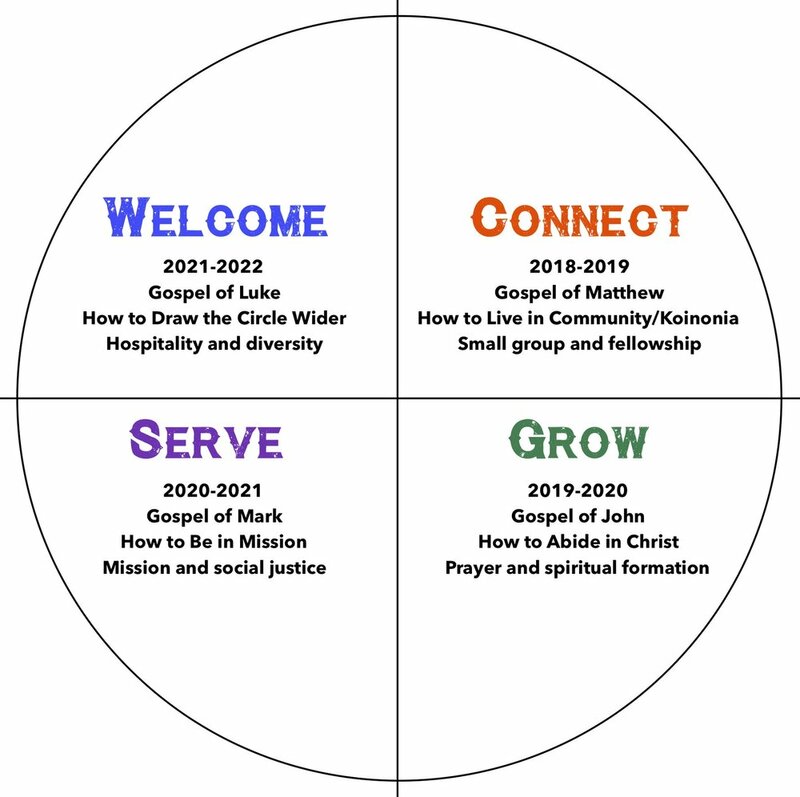 The next step will be for the Church Council to hear conversation about, and take a vote on, the proposed new mission and vision statements, which will happen in the next Church Council meeting, scheduled for Wednesday, June 27, at 7 pm. All are invited to attend. I’m energized by this, as I hope you are. More significant to me than the results and findings of this task force is the fact that 14 people, some of them strangers to each other at the outset, bared their hearts and joined their minds together in a common effort to make Kessler Park UMC stronger and more vibrant. This church has a strong future! My sincere thanks to all who participated, including: Sally Climer, Josh Deluna, Ashley Flores, Bridgette Hardy, Avia Haynes, Mattie Jette, Kacy Jones, Charity Meeker, John Mitchener, Barry Nash, John Ogren, Robert Rodgers, Donald Shugart, and Chris Shultz.